Did you miss the exhibition? Click here! to be [defined] aims at articulating two main concepts about displacement, migration and exile: definition and construction on one side and de-construction and resistance on the other one. Starting from the many representations and definitions of the persons that we call “migrants”, the exhibition investigates the means, rhetorics, rituals, discourses, limits and banalities, the institutions, the imaginary and the relations that construct the object “migrant” and the extent to which this construction is affecting the lives and the imagination of the same subjects. On the other hand, it will also take into account the resistance of the subjects, namely how each person manages to reclaim their subjectivity and their identity as individuals beyond the label they are given of migrants. This act of reclaiming can occur across different lines of struggle, both intimate and public, but all militant, all revolutionary, all related. Migration, dissent and transgression have always been characteristic of the human evolution since the beginning of time. 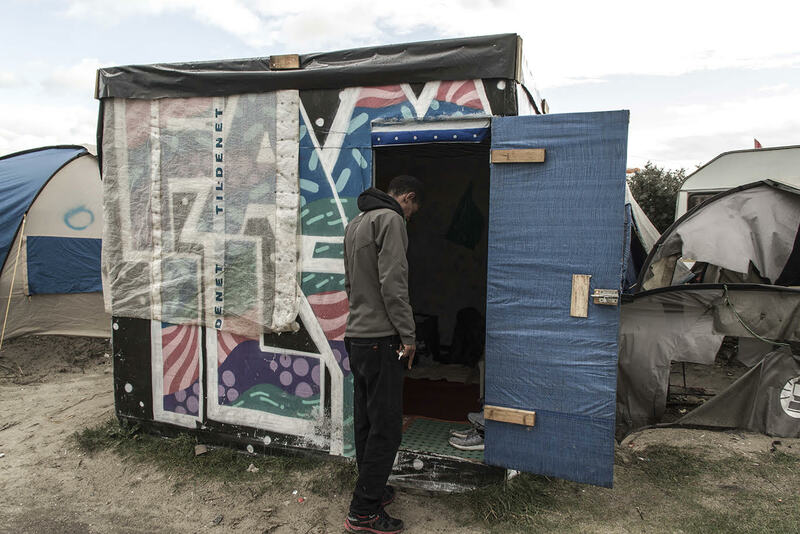 The Jungle of Calais was a city until the 24th October 2016. A city with places of worship, bars and cafes, mafia networks and informal architecture that did not always match with the daily chaos, and the variety of inhabitants. Space C, 8pm onwards - A guided tour of the exhibition with the artists and the curators. "Rethinking borders. Africa in Rome" with the anthropologists Giulia Casentini and Giulia Riva. There is an ancient bond between Rome and the African continent. The evening will be dedicated to a consideration of this long-standing connection between the two regions, in light of how they are influenced by present-day dynamics of inclusion and exclusion, as fomented by contemporary national politics. On the one hand, these policies serve to isolate and criminalise. But on the other, they can also serve as a trigger to stimulate a counter-reaction, in the form of good practices involving both Italians and migrants, who choose to follow a common trajectory. This has also sparked a discussion on the internal borders that delineate the city of Rome. As bookshop engaged with promoting literature and cultural production from Africa and the Arab world, Libreria Griot is one example of such a successful collaboration. Griot succeeds in strengthening that age-old relationship between continents by also promoting a different image of people from Africa, emphasising their position as producers of culture. Studio B, Narrating exile: history and memory in displacement with the anthropologists Marie-Caroline Saglio (Inalco), Alessandro Triulzi (Archivio Memorie Migranti) and David Zammit (University of Malta). The talk will question how displacement operates on narratives of exile by the individuals involved, and will show that the same border crossing has relevance in structuring a memory of the exile, as argued by Marie-Caroline Saglio-Yatzimirsky in her research. The talk will also delve into the important role of The Archive of Migrant Memories.Alessandro Triulzi will explain how the Archive, which began as an informal teaching tool derived from the migrants’ own narrations, eventually grew into an experiment in participatory video and memory-telling, aimed at empowering migrant voices to be heard, and helping Italian society to confront its rapidly changing identity from mono-cultural to multi- and inter-cultural mixed settings. On his part, David Zammit will focus on the ambivalent relations to the topic that arise in a post-colonial context such as that of Malta, as it is expressed in literary and historical documents. A book, at last. Or another artwork? Curated by Virginia Monteforte (anthropologist) in collaboration with Kristina Borg (artist and exhibition designer), Alexandra Galitzine-Loumpet (anthropologist and cultural advisor, Non-lieux de l'exil, Paris) and Sarah Mallia. The exhibition is part of Spazju Kreattiv programme and is also supported by the French Embassy, UNHCR, Vodafone Foundation, iCentre and Heritage Malta. It is part of Exile and Conflict strand, coordinated by Elise Billiard Pisani. Photography by Virginia Monteforte, Paris, 2016.